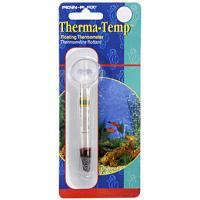 Small floating thermometer that can float in your tank or suction to the inside of your aquarium. 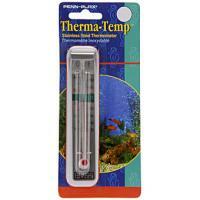 Effectively measures tank water temperature between -10 and 40 degrees Celsius. 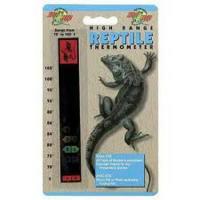 Liquid crystal thermometer for all types of reptile, amphibian or invertebrate enclosures. Scale from 21 to 40C (70 to 105F), with easy to read crystal colouring. Small stainless steel thermometer that hangs on the rim of most aquariums. Effectively measures tank water temperature between 0 and 40 degrees Celsius.